To back up a bit. So basically I had this bump on the back of my hand … and had, for years. Dr. Beldner said I was basically born with a bony “pebble” between the joints that caused bone to rub on bone, forming the boss. It was unsightly, but not really something that irritated me on a day-to-day basis … except when I was flexing my hand backwards (dorsiflexion), something I really only did in yoga. But the tendons did have a tendency to “snap” over the bone spur, and Dr. Beldner said that that could eventually cause problems, like a rope rubbing over a bump. So about a year after I was initially diagnosed I bit the bullet and scheduled surgery. It did not initially seem like a big thing but by that night prior to the surgery I was kinda anxious about it and didn’t get much sleep. 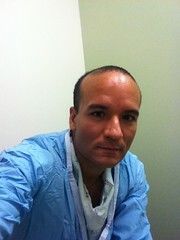 I had to report to the surgery center, Phillips Ambulatory Care Center, at 6:30 a.m. on Monday for the surgery. (No eating or drinking past midnight the day of the surgery, although I messed up and had some water in the morning). Getting the injection for local anesthesia in my wrist was fairly painful. The anesthesiologist thanked me for not swearing. And then he put me under. The next thing I remember, I was waking up with my hand and forearm in a soft cast (pictured at left) and a throbbing pain in my right hand. The anesthetic had already worn off! Thankfully they had Percocet. I arrived at the hospital at 6:30 a.m., had the surgery at 8:30, and had my friend meet me to take me home at around 11:30 … but I actually wasn’t quite ready to leave when she got there. Was still going over things with one of the nurses. And I was maybe a little loopy. But I think we left at around 12:15-ish. We made the right decision to get my pain medicine filled at a local pharmacy rather than waiting in line by the one at the surgical center. I’m not going to lie: The next 24 hours were kind of rough. Even tho I was on oxycodone, that just sort-of dulled the pain; it didn’t take it away entirely. Even though it was a small incision, I guess anytime you mess with bone it hurts quite a bit. Thankfully Dr. Beldner called me the morning after the surgery and told me that by the afternoon, the pain would have really diminished… and he was right. I actually work evenings and felt well enough that I went into work that night, although I left early and was maybe a little loopy from the oxycodone. I quickly switched over to regular Tylenol, taking my last oxycodone Tuesday night. Also: I had this big bulky foam thing to rest my hand in! Because I had to keep it elevated at all times to reduce swelling. It was a little more conspicuous than I wanted to be. But I guess it was nice to have something to rest my hand in. During this time wearing the soft cast I had to wrap my hand in a plastic bag and seal it with tape so I could take a shower. 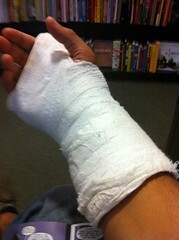 But … as of Wednesday, Oct. 17, I am out of the soft cast and into a removable splint. It still hurts to make a fist or flex my wrist. Even though the skin has healed, Dr. Beldner says he had to displace ligaments from the bone in order to remove arthritis that had developed in the joint. The ligament is currently sutured down to the bone, but it will take four to six weeks to heal. I have to be careful with it, otherwise I could bust the sutures and need more surgery. Eek! But as long as I keep my wrist immobilized, it is really not THAT uncomfortable. Still, no yoga for awhile, alas. Hopefully I will look back from this in a few months and be like, it was all worth it!! Anyway, I guess everyone’s experience with surgery is different… but that has been mine, so far. UPDATE 2/21/2012: I’m happy to answer any questions people might have about my own experience in the comments… but keep in mind, I’m not a doctor, just a dude that had the surgery. I can’t predict what your experience will be like if you end up having the surgery, or give you any medical advice. UPDATE 3/18/2014: So it’s been 2 1/2 years since I had the surgery! And I’m certainly glad I did. I would say it took about a month or so for my hand to get back mostly to normal, a few more months until a firm handshake or a rap on the knuckles wouldn’t make me wince, and a year until I didn’t notice any real difference between my hands doing yoga. Read some of my comments to this post from the beginning to get the various updates as I gave them. UPDATE 9/8/2017:Since people have asked … no, I didn’t try “steroid injections”. Nor was this discussed as an option. As I have mentioned, this was never something that was causing me pain so I’m not sure what the point would have been. The issue was the tendons snapping over the bone spur. I think I also have this in my wrist, I was just wondering if you play sports? And if you do how long it was before you could play again after surgery? I play volleyball so assume I wouldn’t be able to play for quite a while! Much like Derek, my carpal boss was causing a ton of pain at yoga. It got the point where I couldn’t hold a plank without compensating by bending my elbow, which in turn made my shoulder start to feel sore. I saw a chiropractor who thought he could massage the bone away from the tendon, but that sounded like nonsense to me. I saw two orthopedic surgeons, both of who assured me that the surgery would be no big deal. I was a little put off by how nonchalant they were, but in the end decided to follow through with it. Last week I had the capral boss removed, and so far the process has been as easy as they said. They gave me some kind of mild sedative during the procedure, but it might as well have been full on anesthesia. I don’t remember a thing. The first two or three days it hurt to pick up things that required a grip, like a heavy bottle of water, and I stayed away from driving for two days, but now I’m feeling great. The stitches are still in–they should dissolve in another week or so–and while I’m a little concerned by some inflammation around the stitches (it looks like the carpal boss is still there!) I’m hoping that will go away. I have my post-op appointment in a few days and will wait for the doctor’s thumb’s up about starting yoga again. Cost-wise I’m still not sure what this will cost me. I have an HMO and the co-pay before the procedure was $1100 but I’m sure I will be getting a bill soon. Hi friends, I am from India and sharing my carpal boss surgery experience. History: I am 43 years old male (as on 31/01/2018), vegetarian, 165 cm, 86 KGs. 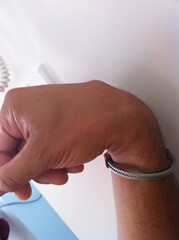 I first observed a small lump on left wrist in 2010 when because of pain and swelling in the left hand wrist. Was it there earlier or not, I have no clue. I had undergone numerous tests that includes MRI scan, bone density, x rays, nerve scan, blood test, Uric Acid test and a lot more. I had been consuming pain killers (most effective of them were Zero Dole P 500 mg and Voveron IP – i.e. Diclofenac) on every alternate day. Reason why I pushed the doctors for surgery: Although, the pain will subside under the effect of anti inflammatory drugs, the side effect of such drugs were becoming prominent day by day (i.e. reduced stamina, reduced immunity level, irritating behavior etc.). So finally, i made up mu mind to get rid of this through surgery once for all. Operation Day: Reached in hospital with prior blood report, x-rays etc at 10 am on 27th Jan 2018 (at MaxCure Hospital, Hyderabad, India). Operation started at 2 pm IST and finished within 1 hour. Local anesthesia was given to me and its impact lasted for 6 hours and then I was allowed to go home. My Experience in OT room: Under effect of local anesthesia, I was able to see, talk and feel the touch of instruments. Doctors used a small chisel and hammer to remove the bone spur which came to me as a surprise. I thought they will use some sort of grinder or cutter to get rid of this small bone spur. Anyway, after removal of bone, they applied some bone wax to fill the space and stitched the wound. 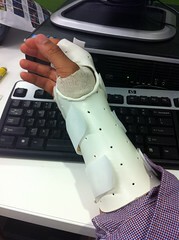 My left hand was made immobile by application of plaster. Post Operations: I am back to my regular work after 4 days of rest. Still the plaster is there, and I am still consuming pain killers. Hopefully, this will fix the immobility and pain (that became part of my life) in next 4 weeks. Overall: I had wasted a lot more money over the years and consumed poisonous pain killer drugs in order to avoid surgery. If you have carpal boss, get it removed through surgery instead of consuming medicines. As per records, carpal boss once operated will not come back in more than 95% cases. THERE IS NO CURE TO CARPAL BOSS OTHER THAN SURGERY. IF YOU DON’T GET IT REMOVED, IT WILL CAUSE ARTHRITIS WHICH WILL MAKE YOUR LIFE DIFFICULT FURTHER. Hello All! I am 57, retired dental hygienist and avid tennis player and practice yoga. 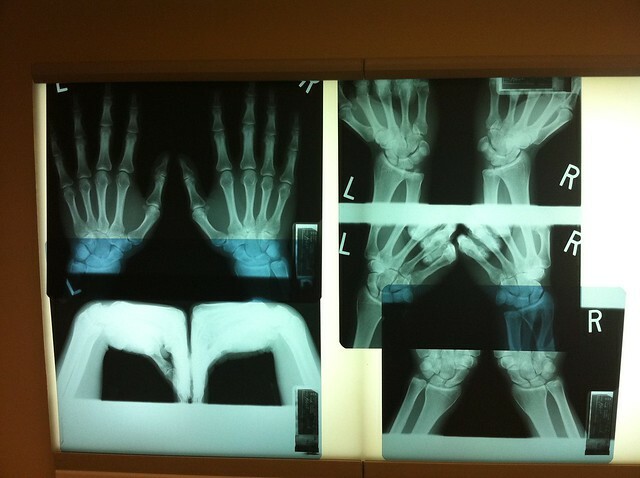 1/16 I was diagnosed with bilateral dorsal osteoarthritis in my thumbs. I get cortisone shots in right hand (dominate) every 6 months. 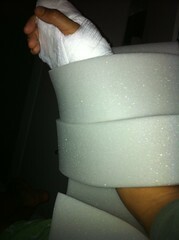 I ah e also had ulnar reduction surgery and repair of the triangular ligament in the right wrist/ arm. In August 2017 I observed what I thought was a cyst forming on top of my right hand. By December it had become painful with decrease in grip strength and burning sensation to the index finger. On 2/2/18 it was diagnosed asa Carpal Boss. Doctor said conservative treatment the best option. He also said that a cortisone shot in the carpal nose could make more problems. My goal is to return most of my grip strength and decrease the pain. I hope to do this with anti inflammatory topical and oral treatment in conjunction with therapeutic ART (Active Release Treatment) manipulations by a certified ART practitioner. I am still playing tennis but have cut my play commitments in half. I have also changed my racquet (lighter) strings and grip size (larger). Yoga poses hurt more than tennis play. I am also wearing a wrist splint. When I am not playing tennis. And use the wrist splint for support when I practice yoga. My pain level is a 7. I will log in with progress. To clarify: the wrist repair and ulnar reduction surgery was successfully completed in 2010. Ron — don’t know how much good this will do 4 years after your question. So far I have done nothing surgically or otherwise. I did go back to the doc a couple of times to see if he wanted to change his diagnosis since I have no large protrusion as many here have described. He didn’t – said that sometimes the boss is only a small bump. After that I played 3 years with minimal pain – took Aleve the days I played and that was it. Last year I played 30 or so times. However,toward the end of the season the pain returned as bad as ever and I simply stopped playing. The result is the same as before – no pain except when swinging a club. Now that spring is near I want to play again. By the way, my one cortisone injection worked for 3 days and I haven’t tried another. I’m dilly dallying – I’m still not enamored with the idea of surgery – so I’m trying different ways to grip the club. I would guess my comments aren’t terribly helpful. I think this is a very individualised problem which does not really have a universal solution. And, as I get older, am resigned to the fact that some things simply won’t be as good as new no matter what the course of action. Doctors aren’t magicians and they don’t know everything. That’s not a criticism – just a fact. Be your own researcher and advocate. I hope your situation has improved. Hi, my name is Will. I’ve had [meta]carpal boss on my right hand, when first noticing it in 2015. I wasn’t diagnosed until Nov. 2017. I recently turned 23 in December. I had an X-ray and they couldn’t find anything. I then had an MRI and the diagnosis came up as carpal boss. It was caused from spinning on my wrist/back of my hand from breakdancing, I’ve been dancing for 11 years and started spinning more frequently on my wrist in 2012/2013. I received surgery Feb 16, 2018. It’s been over 2 months with no dancing or use of my right hand. I have a fear of it growing back because of the size of swelling and it feels hardened like bone. Surgeon says to wait till August (6 months post surgery) because it’s too early to tell but occupational therapist feels it’s scar tissue. I have no problem it growing as it long as it doesn’t interfere with me dancing at a high competitive level because it caused me pain when flexing my wrist due to it covering 90% of the tendon. But the surgeon said if surgery is neccesary again, they’d have to take out the tendon to shave the bump completely and then place the tendon back but I would lose natural strength in my hand and it wouldn’t be the same. So far after deep massaging 3x daily the swelling and mass has gone down a lot. Will keep updated through here but could not find anyone in my area of physical activity that has gone through this and it’s not very common a case. Glad I found this blog. If anyone knows or has gone thrrough it regrowing please let me know. Thank you for this information. I was told I have Carpal Boss as well. I have surgery scheduled in less than 10 days. I want sure what to expect but your information has eased my mind a bit. I never even had heard of this before I thought it was a rock hard Gangleon cyst but it’s a carpal boss. I can’t wait to be pain free and get back to driving long haul. I know this is an old post and times have also changed. If you don’t mind sharing, what was your final invoice for surgery. Or perhaps total out of pocket expenses. I am considering surgery this winter.